10th Period: ECOT gets an A in Achievement because kids weren't chronically absent. Huh? ECOT gets an A in Achievement because kids weren't chronically absent. Huh? The new state report cards just came out with overall grades being issued for the first time. And outside of telling us what every report card has told us over the years -- namely that Ohio's school districts and buildings perform far better overall on state report card measures than charter schools -- there's an interesting outcome for the Electronic Classroom of Tomorrow (ECOT). ECOT has never done well on the state report card. 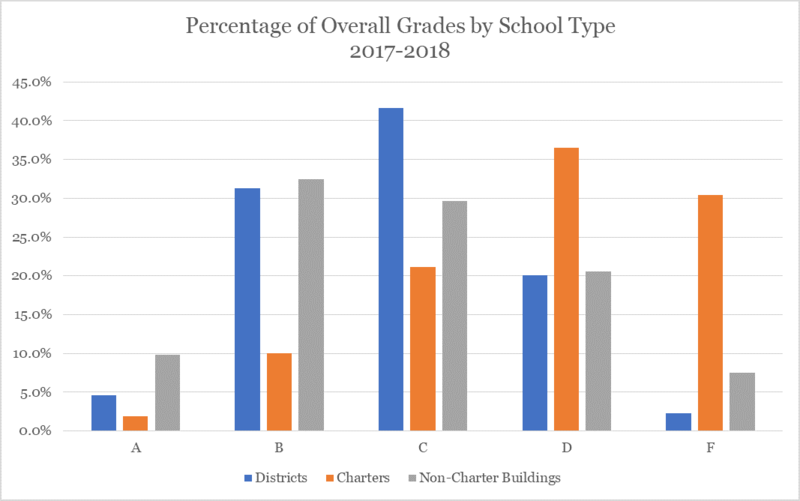 Of the 53 possible grades it could have received through the 2016-2017 report card, it got 46 Fs. It was especially bad in the components that make up the overall achievement component. The overall grade is determined by merging the six categorical grades (Achievement, Growth, Graduation, Cap Closing, Improving at-risk K-3 Readers, and Prepared for Success). This year, ECOT got an A in the Achievement Component. How can this be when ECOT has historically been the worst performing school in the state? The answer lies in the fact that ECOT closed half way through the year. So the school did not get graded on several components that it traditionally bombed. The only Achievement category indicator it was graded on was meeting state indicators -- raw test score information. Schools can be graded on up to 26 different indicators, depending on how many students the schools tested that are in each category. For example, if a school doesn't have high school students, it won't be graded on the performance of high school students. Last year, ECOT met 0 of the 23 indicators it was measured on. This year it met one indicator. And it was only measured based on one indicator. What was that indicator? I kid you not. It was chronic absenteeism. Last year, 13.5% of ECOT's kids were listed as chronically absent. This year, it was 7.5%, which met the indicator and qualified as an A. That's right. The school that ripped off taxpayers by at least $200 million because it charged for kids who were never there, or were absent for whole months and seasons of time got an A from the Ohio Department of Education because kids weren't chronically absent. So when you see that ECOT got an A in Achievement on the state report card, let's perhaps take that with a grain of salt. Prioritizing & making anything smooth always senssse the best in any ecosystem. To protect along with run the entire process flows for all mentioned activities works properly. If someone go by the prescribed way then proper research plus authenticity is needed to proof the scenario. Substantial mechanism always shows the true path to make the documents or finished products perfect. Many schools get desire and needy reward for having perfect attendance in click here. The matter of health is big issue for perfect meeting of require needs for getting education on daily basis without break. Record getting in form of performance leads for make name in area and many schools get name due to their working for good results by the site. The source of faculty and the training leads for good return in term of name development. If you create interest of the children in your teaching so the students do not get absent and that is https://www.futuremdresidents.com/team/ trying to teach us all the time by the site. This report is quite crucial and i can wonder about it's result. The acheivement in this field is perfect and www.sopwriting.org is going to be useful . Wow i meani serious this report is showing 100% attendance of students which is unbelieveble. Well this site https://www.summarizing.biz/how-to-write-a-500-words-summary can give us best opportunity. I am currently the Education Policy Fellow at Innovation Ohio. I also practice law in the Akron, Ohio area. Prior to this, I was the State Rep. for the area and was the Chief Legislative Architect for Ohio's Evidence Based Model of school funding, among other things. It won a national award for being the country's most "bold, courageous, non-partisan" education reform of 2009. Prior to that, I was a reporter with the Akron Beacon Journal and won several statewide awards, as well as a Pulitzer Prize nomination in 2003. The opinions I express here are mine, not Innovation Ohio's. Ohio Charters need a 22% Raise? Really? State Superintendent Tells New School Board Members Ohio School Funding is Constitutional. Data Say He's Wrong. DeWine Misleads on Commitment to Poor Kids. It's Not Unusual. DeWine K-12 Budget: Holding Pattern for the Real One. Testing the Boundaries: Part II - What Can Outliers Teach Us? This Blog represents the opinions of the author, not necessarily those of Innovation Ohio. Picture Window theme. Theme images by Deejpilot. Powered by Blogger.